The whole gang, minus Wesley Crusher. The first thing that crossed my mind was that Deep Core must be a no-budget rip-off of The Core. Then I checked the release dates and realized that it must be the other way around: The Core is really the multimillion dollar rip-off of Deep Core. Alright, it probably isn’t. But it could be! Craig Sheffer plays a guy who has developed some kind of laser-powered drilling machine for subterranean use. The film opens with Craig blowing up the lab (or at least setting off a bunch of fireworks) to prevent the technology from being used as a weapon. Craig goes off to start a new career, drilling for oil together with Wil Wheaton, a.k.a. Ensign Wesley Crusher of Star Trek: The Next Generation, a.k.a. the guy that Trekkies love to hate. Wil has that characteristic man-child look, and we’re treated to a slightly ridiculous scene where he cavorts drunkenly with two girls in their undies. As mysterious earthquakes rock the world, Craig immediately realizes that his old boss is up to no good, and heads back to civilization. He storms into the office, shouting: “Congratulations, you’ve just triggered global destabilization!” Yes, some of the dialogue in Deep Core is quite memorable, if not for the right reason. Since this is a made-for-tv cheapie, where the screenwriter probably spent several minutes making sure the plot was coherent and credible, it is decided that the way to stabilize the tectonic plates is to plant a few nukes around the Pacific Rim. 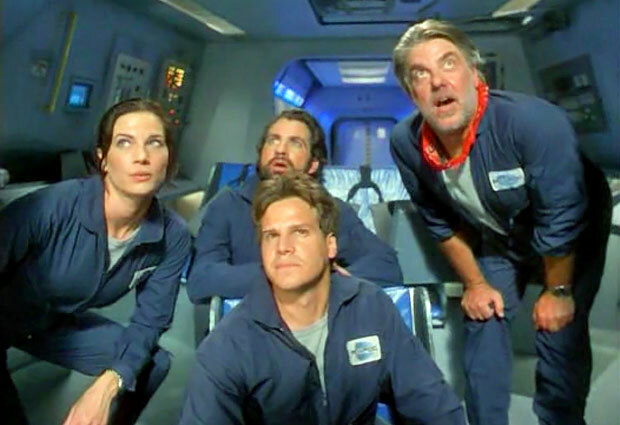 Craig and Wil, now joined by Terry Farrell of Star Trek: Deep Space 9 and Craig’s devious ex-boss, jump into the underground laser-drill vehicle thingy, which — in order to withstand the extraordinary pressure and heat deep down inside the Earth — seems to have been built from plywood. As the team drill their way through the planet, dropping off nukes here and there, they discover that the project has been usurped by the Chinese government, who intends to use the vehicle as a weapon. Craig’s boss makes amends by sacrificing his life, while the surviors surf a tsunami of magma up to the surface through an underwater volcano. If you enjoy cheap TV disaster movies featuring silly plots, tin-eared dialogue, poor visual effects and littered with the sad remains of once-promising acting careers, then Deep Core is certainly something for you. There really isn’t all that much more to say about it. It’s quite bad in just about every respect, from the garish opening credits and on, but it’s absolutely good for a few laughs. We do get several disaster scenes — a nameless island explodes, Mount Pinatubo blows up and California is shaken by quakes — but they are all disappointingly short, and we’re soon back in the safety of he plywood sets. The high point for me, as an old fan of Star Trek: The Next Generation, was of course to watch Wil Wheaton’s character hilariously perish in a cascade of digitally animated magma. By far the best death scene in the film. This movie wasn’t actually released in the theater was it? We are talking straight to video or sci fi network? I can’t imagine paying and sitting in a theater watching this. It’s more of a nothing better on during a Saturday afternoon movie.